The Sig Sauer P290 is a small frame pistol designed specifically to be a light weight conceal and carry pistol for self-defense, along with back-up weapon purposes. 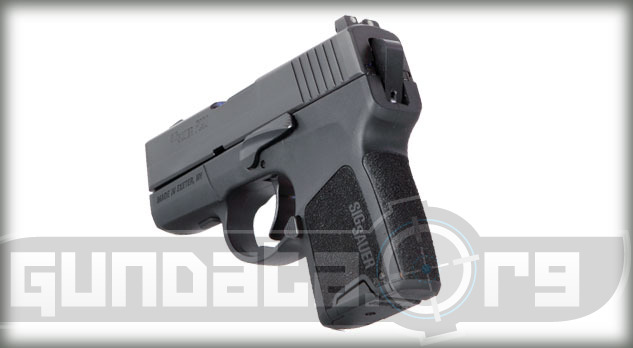 It is a low profile semi-automatic pistol with the hammer resting in the hammer safety notch of the slide and frame to help reduce snag on clothing. It has an overall length of 5.5-inches, with a height of 3.9-inches, and a barrel length of 2.9-inches. The magazine holds 6-rounds of 9mm ammunition. The P290 has a polymer frame with a black finish. The slide is stainless steel with either a Nitron or stainless finish. It comes in double action trigger only, with a pull of 9-pounds. The sights are the 3 white dot SigLite night sights. The grip plates are removable to allow users to add customized plates with engravings or initials on them. The frame also comes with an optional laser mounted into it.